Hot Spot: all eyes are on the prize of world-class oil discoveries, following successful exploration rounds in deepwater Gabon. Map showing exploration performance and location of drilled wells. Gabon has a long history of oil exploration on- and offshore. The last two decades saw production onshore and along the shelf dominated by Shell and Total, the Tullow JV, and juniors Vaalco, Perenco and M&P. Significantly, both Total and Shell sold the majority of their production in 2017, indicating their retreat from the mature onshore. All eyes are on the big prize of world-class oil discoveries in deepwater, however. The most recent newsflash in support of this is Boudji-1, drilled by Petronas and Woodside, with reports of a 90m gross oil column pre-salt. Following poor results at Sputnik, and gas and condensate at Diaman and Leopard, this discovery of liquid hydrocarbons has galvanized the deepwater players. On 18th April 2018 Woodside Energy announced a 2nd discovery on their Ivela prospect, finding a 78m gross oil column. Predominately the Lower Cretaceous play, with potentially large structural prospects in the pre-salt. Prospectivity certainly exists post-salt, in well-imaged marine clastic turbidites, channels and fans in the Upper Cretaceous and Oligo- Miocene. Very large pre-rift faulted structures, with lower trap risk and larger prospective volumes, also lie beneath the complex Aptian salt. The Aptian Gamba reservoirs are proven onshore and nearshore. As are the Dentale sandstone formations. Both comprise high poroperm fluvio-deltaic syn-rift clastics, with lacustrine deltaic facies seen onshore. Stratigraphic column of South Gabon, Africa. Apto-Barremian Melania lacustrine shales - with recorded 20% TOC Type I kerogen. The combination of this prolific source, thick Dentale sands in very large structural traps in rotated syn-rift fault blocks, sealed by late Apto-Albian transgressive marine shales and the Ezanga salt, provides all the ingredients for giant oil discoveries. The risks are still high: the gas and gas condensate discoveries suggest other kerogen types or greater burial histories; at least one major inversion event affecting source, trapping and overall charge mechanism has been documented; charge retention is complicated by faulted salt seal; and the required juxtaposition of source and reservoir may not be present. Who's Investing in Deepwater Gabon? In addition to Shell and Total, Petronas have a commanding position in the region with blocks F14 (Boudji-1) and E13. 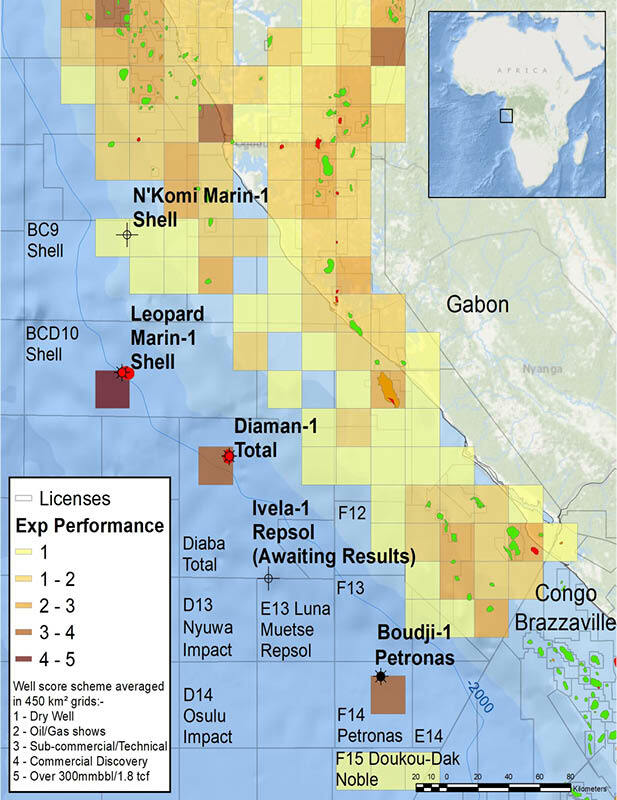 Repsol will operate the next E13 well (Luna Muetse Ivela 1), Noble have a strong position in Block F15 (Douku Dak) and Woodside an excellent spread of interests from Diaba to F15, E13 and F14. Impact Oil & Gas, with a strong West African deepwater portfolio, hold blocks D13 and D14 in ultra-deepwater, with very large pre- and post-salt prospects based on high quality modern 3D. To the south-east in shallower water, Spectrum have acquired a large multiclient 3D survey in a similar pre-salt play in the Gryphon area, and Vaalco, Perenco and others are working up the shelf and shallow plays. Adjacent acreage in F12, F13, E14 is understood to be subject to negotiations in the Bid Round announced by DGH in 2016. The development of this large oil play in deepwater pre-salt Gabon is significant for the industry in West Africa. A Cretaceous play, challenged by deep structural targets usually under salt, thus requiring the latest 3D processing and interpretation, this margin is yet to reveal a full-cycle success story as envisaged and proposed by avid Brazil-watchers. Kwanza has disappointed to date, but there are encouraging signs of a Lower Cretaceous-sourced petroleum system succeeding in the Mauritania/Senegal area, Gulf of Guinea and south-west Africa. The industry is determined to discover the truth behind the concept of vast oil volumes in pre-salt in West Africa near the limits of exploration technology. These hydrocarbon hotspot features are brought to you in association with NVentures. Miocene deep water sands were the target for the Macondo well in Mississippi Canyon Block 252, and it is probably from one of these sands that the blowout originates. Cairn Lanka, a subsidiary of Cairn India, has struck gas in the offshore Gulf of Mannar Basin between Sri Lanka and the southern tip of peninsular India.